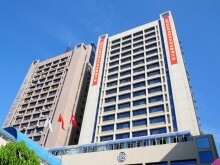 Located in 12 Haixiu Avenue, Haikou City, Hainan Oscar Hotel is a trendy and quality four-star hotel, covering a land area of 2,804.67 square meters. It’s a 21-storey high building with another 2 basement carpark floors, the total GFA of the 21 floors and the basement carpark floors area 22,803.13 square meters and 1,441.76 square meters respectively. The Hotel has a total of 222 standard guest rooms and luxury suites. 1/F is a lobby floor with also a western restaurant and a coffee shop. 2/F is a floor with retail shops. 3/F is a Chinese food ball room and multi-functional conference room. 4/F is a KTV nightclub. 5/F to 20/F are guest room floors.